The Cybertron CLX Ra is a performance powerhouse that undercuts its competitor’s pricing. If you want a high-end gaming PC, and you don’t have the time or know-how to build it yourself, there’s no shortage of companies that will put it together for you. 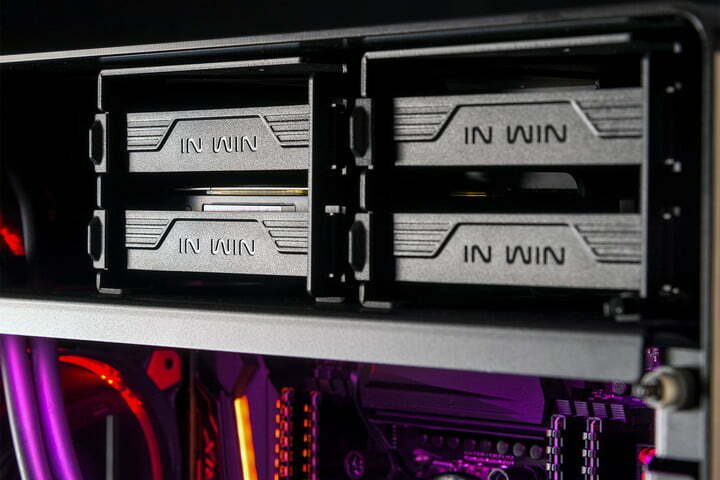 There are some that lean towards custom enclosures and premium features, like the Falcon Northwest, and others that seek to put performance as close to home-built prices as possible, like the iBuyPower. Right in the middle is Cybertron PC. Its CLX Ra is the company’s next step in a move by Cybertron to provide a more bespoke service. Our review unit is proof of that evolution, with an Intel Core i7-6950X overclocked to 4.4GHz, 32GB of DDR4-2666 memory, a Samsung 950 Pro SSD, and a pair of GTX 1080s, all packaged up in an Inwin 909 eATX case. Ringing up at $5,575 for our review unit, the CLX Ra isn’t cheap, thanks to its high-end components. Is it worth the cash, or should you save your pennies for something else? Style is definitely a strong point for the CLX, no matter how you customize it. 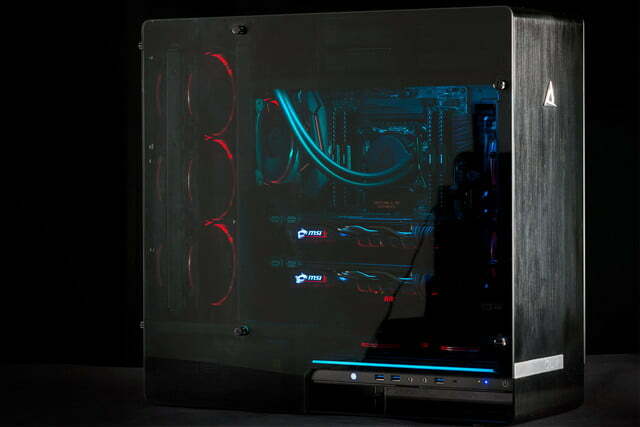 The Inwin 909 case may be the same case you can buy for yourself, but Cybertron offers a swath of paintjobs, lighting options, and cooling configurations. The outside shell is a smooth band of aluminum, with smoky tempered glass panels that cover the entirety of each side. When the system is off, it’s completely unassuming, with dark, translucent glass hiding the components inside. Turning the system on illuminates the otherwise invisible components. 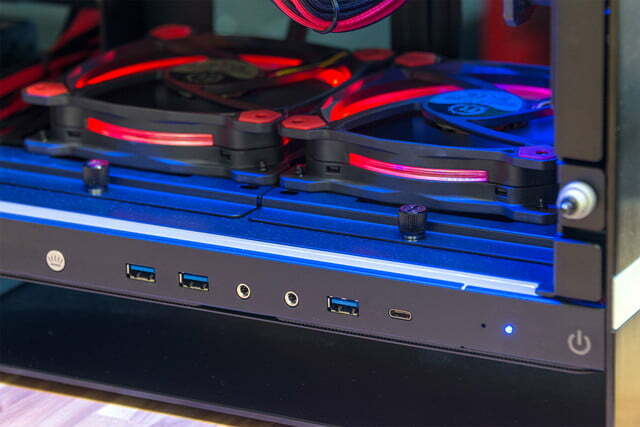 Ours even had a few RGB LED strips across the top, although the red fans outshone them brightly. Whether that look is right for you depends on your preference, but it’s certainly a departure from its competitors. The Falcon Northwest Mach V takes a much more understated approach, with a tall case with no windows and easy access to connectivity on top. 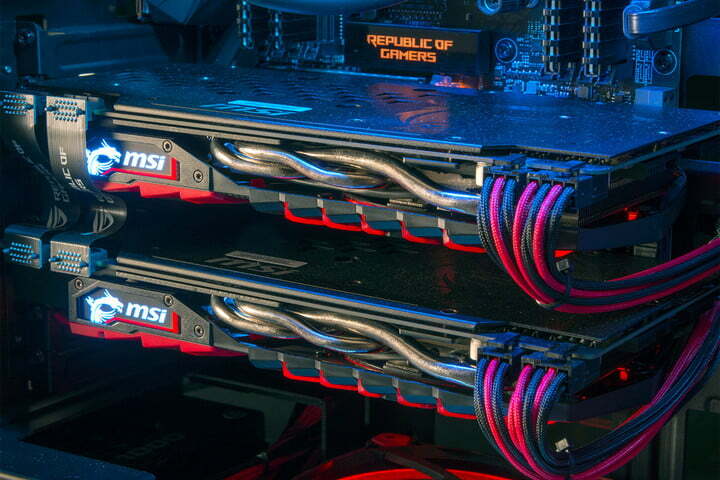 Origin’s Millennium leverages a custom chassis that falls closer to the gamer side of the aesthetic spectrum. The Digital Storm Aventum 3 is also an off-the-shelf enclosure, but has plenty of windows and cooling options. Discussing connectivity on custom-built systems is always a bit tricky, as your chipset and motherboard choice will heavily influence the available I/O connections. Our review unit boasts an Asus ROG Strix X99 motherboard, with two USB 2.0, four USB 3.0, one USB 3.1, and a Type-C port, plus Gigabit Ethernet, 6.1 digital and optical audio ports, and PS/2 for those who like their ports with some old school flavor. This model also has built-in Wi-Fi, so there are two antenna plugs, as well. You’ll have to carefully remove one of the floor-to-ceiling tempered glass panels to plug in USB devices. Of course, if you choose a Z170 motherboard, you’ll likely trade some USB for HDMI and/or DisplayPort, but those selections are made clear before purchase. Whichever option you choose, you’re going to be dealing with a far more pressing issue – the case. The Inwin enclosure used by our Ra review unit has a distinct layout that actually puts the motherboard at the center of the chassis, with a divider between it and the outside of the case. As such, there’s about four inches between the rear I/O ports, and the back of the case. They’re only accessible through a narrow rectangular hole in the rear, with the CPU’s massive liquid cooling radiator’s exhaust taking up the rest of the panel. You can try to plug in devices without removing a side panel, but only if you have small hands. Otherwise, you’ll have to carefully remove one of the floor-to-ceiling tempered glass panels to plug almost anything in. Even then, it’s wise to turn the system off, as the rear radiator’s fans are exposed. We lost a little skin off our knuckles when we tried to plug in a monitor with the system turned on. Our review unit has a set of six fans on a 360 millimeter closed loop radiator just for the CPU. If there were an open-loop reservoir in that space instead, changing inputs or adding a speaker would’ve been an even more arduous task. There are a few extra plugs on the front left of the case, include three USB 3.0 ports, a single Type-C, and a pair of 3.5mm headphone/microphone plugs. It’s a good thing, considering the inconvenient I/O panel. 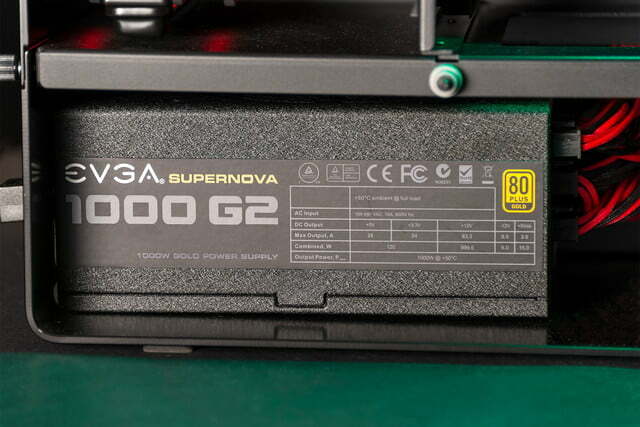 Even those ports aren’t the most ergonomic, as they are located on the lower right-hand side of the case. Depending on where you sit the computer, this will make them either too close, or force you to loop cables around the side of the system. Front-facing or top-facing ports are far more sensible. Apart from the inconvenient layout, which would only be solved by using a different case, Cybertron PC does a decent job keeping the internals clean. Cables are tucked into the back, and like almost every other component and accessory, users have their choice of solid and dual-color PSU cables and fans. And boy, are there a lot of them. 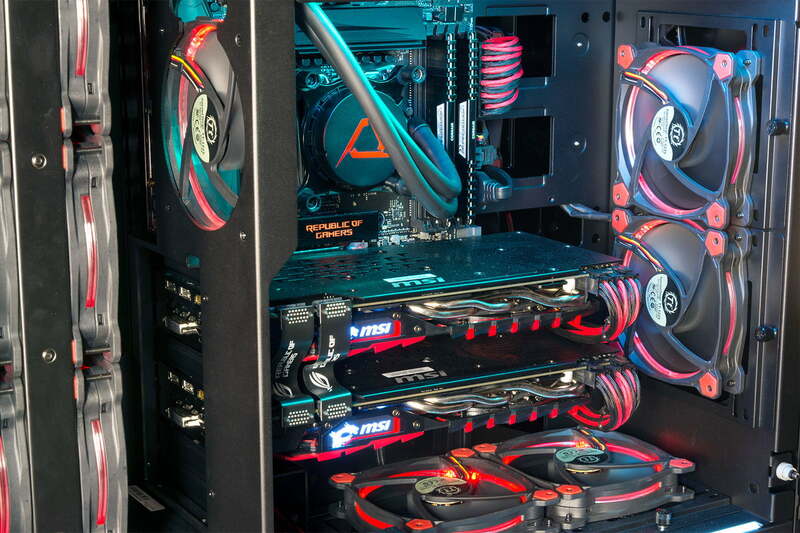 Our review unit features a six-fan setup across an absolutely massive 360mm closed-loop CPU cooler, four intake fans in the front and bottom, and a system fan to push air from the main compartment into the radiator space in the back. The upshot is the Inwin’s support for eATX motherboards, which brings along plenty of room for anything you could imagine. There are four 3.5-inch drive bays in their own attic at the top, six 2.5-inch bays on the other side of the motherboard, plus plenty of room for extras in the main compartment with the motherboard. 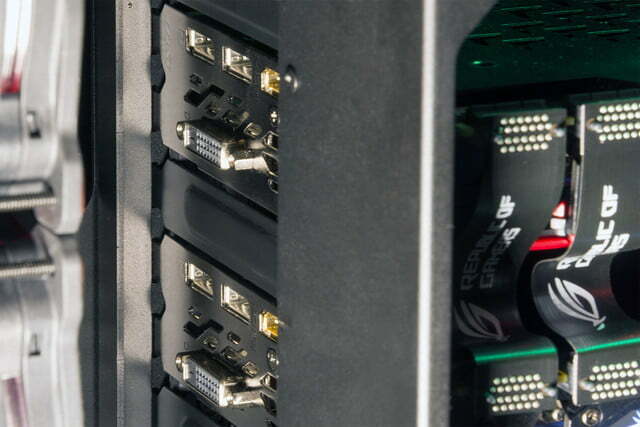 The bells and whistles are important, but the components are the real meat and potatoes of any custom gaming rig, and our review unit doesn’t disappoint. 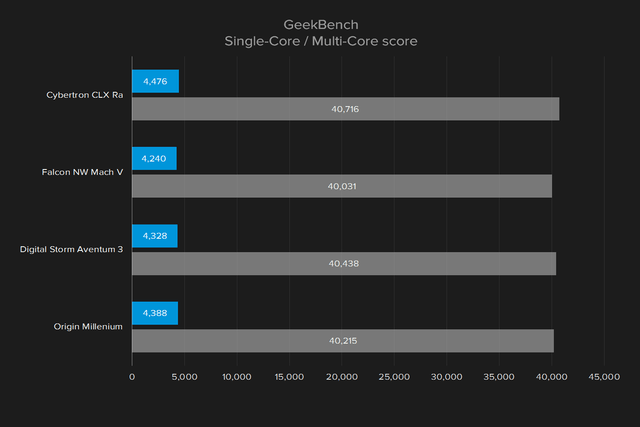 The CPU was an Intel Core i7-6950X overclocked to a healthy 4.4GHz, with a few tweaks to voltage thanks to Cybertron’s in-house overclocking team. 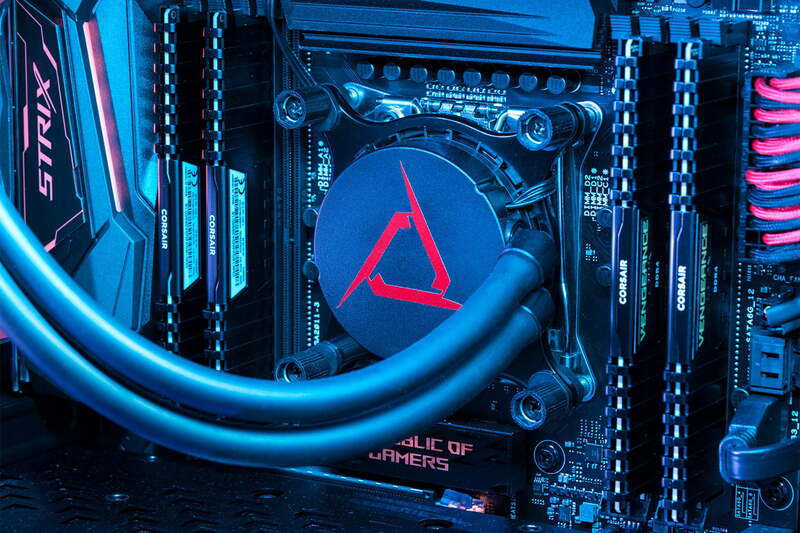 It’s paired up with 32GB of DDR4 RAM — 2,666MHz Corsair Vengeance sticks, to be exact. No surprises here. The CLX falls right in line with its similarly-overclocked competitors. The Origin Millennium is also sitting at 4.4GHz, while the Aventum and Mach V are only overclocked to 4.3GHz. There’s a slight difference, but only one that’s going to stand out during the most CPU-intensive activities. 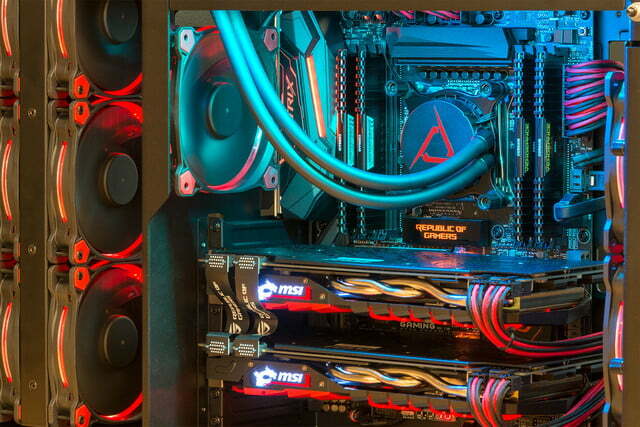 Put simply, all these high-end desktops are absurdly fast. They represent the cutting edge of home PC performance. If you have serious work to do, well, the Ra can get it done. Our review unit was outfitted with a Samsung 950 Pro, hooked up to the M.2 slot under the GPU. 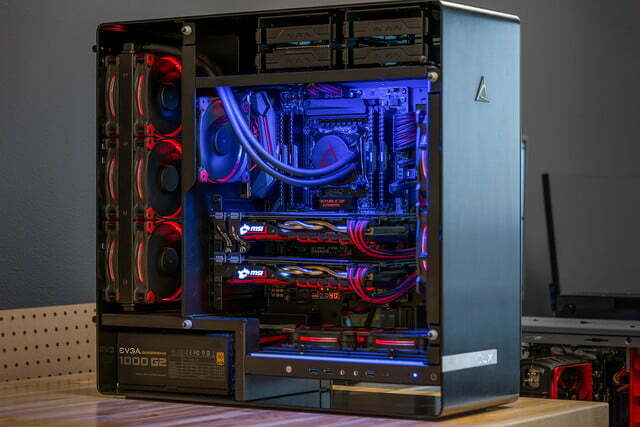 That’s a standard offering for high-end gaming PCs, and for good reason. Again, not much to discuss here. 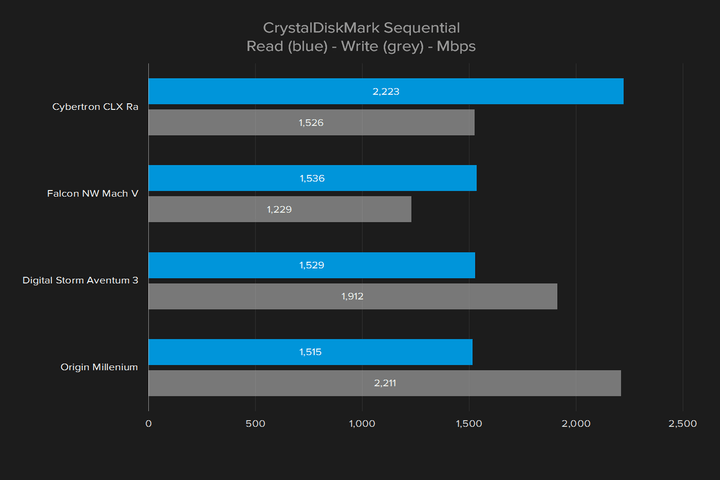 The Samsung 950 Pro has consistently proven to be one of the fastest consumer SSDs on the market, and its place in the Cybertron ensures speedy boot-ups and quick loading times. For extra storage, Cybertron also threw a 4TB hybrid drive in our review unit. That should be plenty of space for most users, with a bit of extra speed when you need it thanks to smart caching. Of course, the Cybertron CLX Ra is a gaming system first and foremost. With a pair of GTX 1080s in an SLI configuration, there are few ways to produce more gaming performance with modern hardware. 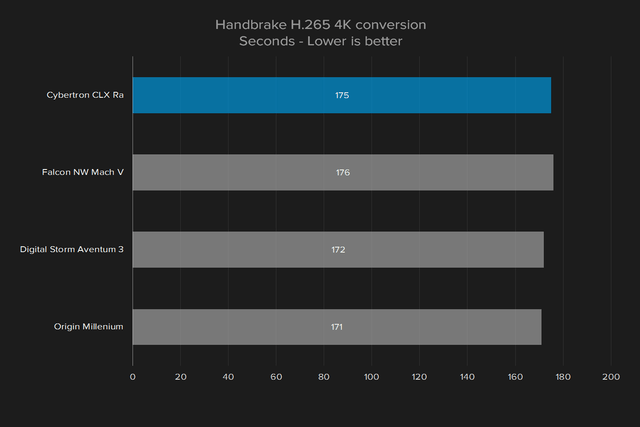 Except overclocking, which Cybertron has taken care of as well, pushing the core clock of both GPUs up an extra 150MHz, and pushing the memory’s clock up an impressive 350MHz. 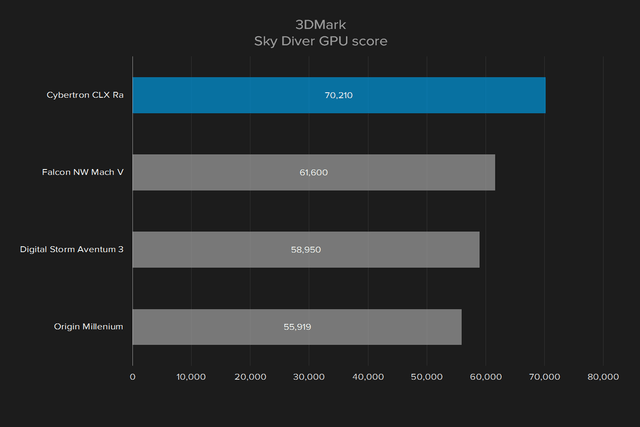 Before we get into real-world testing, we’ll take it for a spin in the 3DMark synthetic graphical benchmarks. That overclocking really pays off here. Cybertron PC definitely wrings the most performance out of this top-end setup, even without the benefit of piles of RAM, like the 128GB found in the Falcon NW. It takes a noticeable lead in both Fire Strike and Sky Diver. 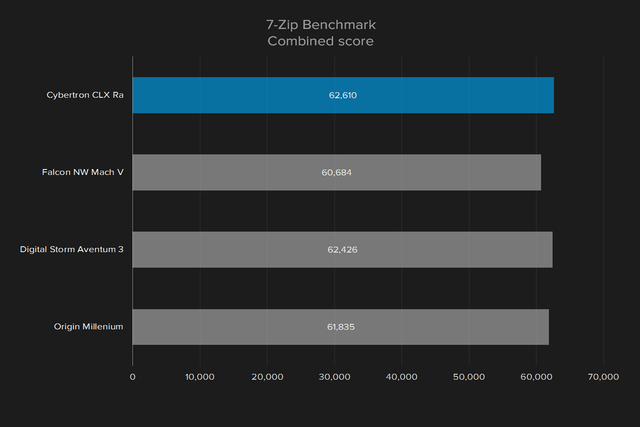 Although we don’t have enough results to compare it to yet, the CLX also claimed a score of 14,274 in the new 3DMark Time Spy benchmark, more than twice the 6,295 score we saw from the single GTX 1080 in the Lenovo Y900. But synthetic benchmarks are only one part of the story. You want to know just how well the CLX Ra runs on the open road. Not content to just fly past our 60 frame per second ideal rating, the CLX is actually the first system to slam up against Battlefield 4’s 200 frame per second engine limit at 1440p, with the settings on ultra. 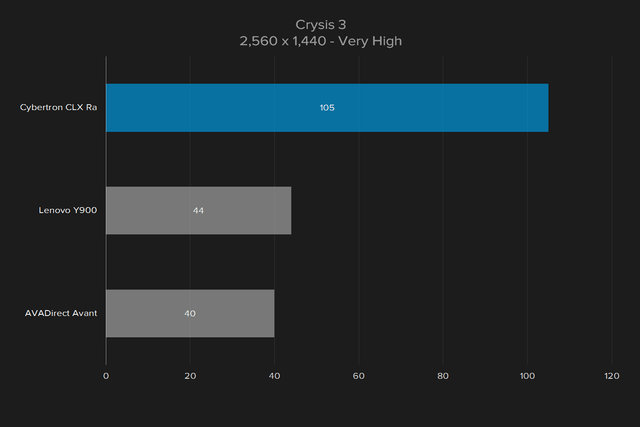 The average even stays over 100 FPS in Crysis 3 at the same resolution and settings. CLX owners with this setup will find that their system is more than able to play any game at 1440p, even on a high refresh rate monitor. With the distinct exception of Deus Ex: Mankind Divided. This game is the newest in our test suite, and demands a ton of power to keep up with the many shadows and lighting effects that illuminate its dense, detailed environments. The Cybertron was still able to maintain a 66 FPS average at 1440p with the settings on ultra, though — no small feat, even for a high-end machine. 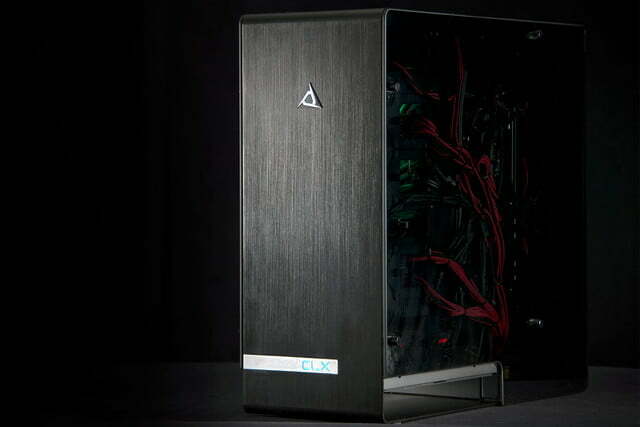 The solid tempered glass panels and aluminum shell means, despite a wealth of fans, the CLX Ra runs near silently at idle. When the CPU kicks into overdrive is when the fans start to create more noise. The huge 360mm radiator is flanked by six fans in a push/pull configuration, and CPU-intensive activities like a Handbrake conversion cause them all to spin into high gear. The result is about 51 decibels on average, much louder than Falcon Northwest Mach V and the Digital Storm Aventum, which both sit around 42 decibels under CPU load. 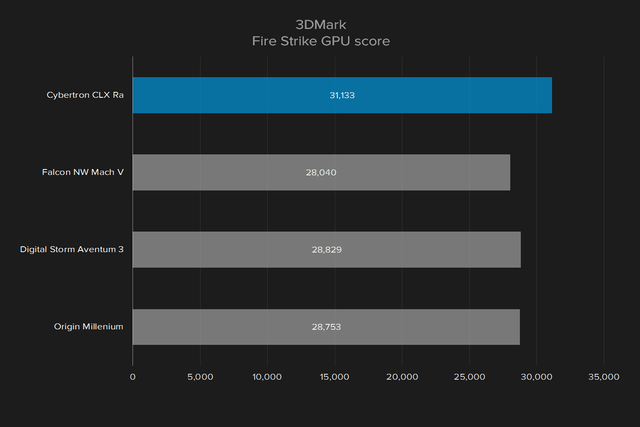 Even with Furmark’s GPU stress test running, the system sat just under 49 decibels – louder than the super quiet Mach V, but right in line with the Digital Storm. The Falcon Northwest has the benefit of a closed side panel. There are certain costs that go along with case windows, and noise tends to be one of them. The good news is the system doesn’t come anywhere near those extremes under normal gaming. The limited cooling options in the Inwin case are largely responsible for its noisy operation while stressed. It has a lot of fans, sure – but it also has just one intake at the front, and the CPU’s oversized radiator is hampered by pulling already warm air from the case’s main compartment, where the motherboard and GPUs are. Cybertron PC wrings maximum performance out of this top-end setup. The CLX ships with thankfully limited included software, with Cybertron instead opting for a cleaner Windows 10 installation. MSI Afterburner is included, while GeForce Experience is notably missing, which many enthusiasts will appreciate. Other than that, the only third-party software we noticed was Sonic Radar, a gimmicky utility that displays directional audio on-screen. It’s a solid addition for those hard of hearing, but we have a feeling most others will ignore it. Cybertron offers a one-year warranty with all of its systems, with the customer covering shipping to the factory. Digital Storm, Falcon Northwest, and Origin all cover systems for three years, with varying degrees of shipping coverage. Cybertron’s policy is the weakest of the four systems by quite a bit, and likely one of the factors that helps keep price down. The Cybertron can game with the best of them, and it shatters our CPU benchmarks. But so do its competitors. It’s not enough for a flagship desktop to be fast. It must also be well-designed. The CLX excels in the former, and struggles with the latter. At $5,575 for our review unit, which is surely more performance than most users will need, the CLX Ra is $500-$1,000 cheaper than similarly equipped systems from other premium system builders. Sitting right next to rigs like the Falcon Northwest Mach V or Digital Storm Aventum, you’d likely assume the CLX is one of the more expensive systems, even though both of those systems fall right around $6,400 when similarly equipped. Whether any of these are better than the CLX depends on your priorities. If it’s all about looking sharp and saving a few bucks, Cybertron is a solid offering. But the Ra suffers an unintuitive enclosure that fails in function, and its overall build quality is not quite on par with the best competition. While it’s impossible to see what might happen with monitor and virtual reality tech in the next five years, it’s safe to say the CLX Ra is a seriously future-proof system. 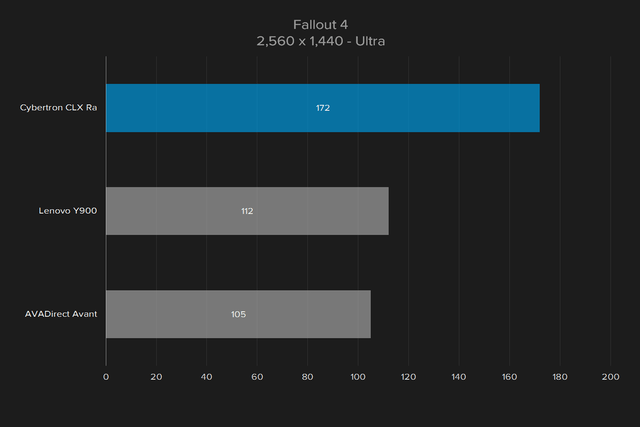 Its 1440p performance shows a lot of headroom. And, since the system is spacious, it should be easy to upgrade. We wouldn’t recommend Cybertron’s CLX Ra as our review unit was configured. First of all, it’s important to remember that most users don’t need two GTX 1080s and a $2,000 processor. 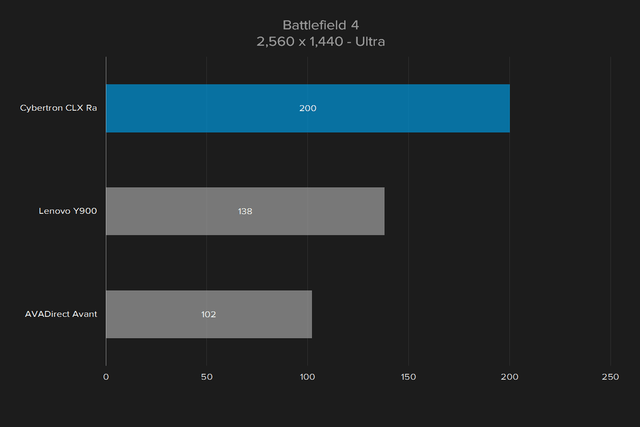 For anyone without a high-end 4K panel or a 144Hz or higher 1440p screen, it’s overkill. Even if you do have that much to spend, the Ra’s quirks make it a pass. You’d be better off spending slightly more on a competitor from Digital Storm, Falcon Northwest, or Origin. If you do purchase the Ra, we recommend you save money by choosing the optional Bitfenix Pandora enclosure, instead of the Inwin 909 case. Though it isn’t quite as attractive, the Pandora case is both less expensive and more functional, because it doesn’t have a strange, recessed I/O panel. When configured in that way, the Ra’s affordable performance will shine. The Cybertron Ra is a stronger choice in its less expensive configurations. For example, it offers a Core i5-6500 and a GTX 1060 for $2,000. That’s the same configuration as the Falcon Northwest Mach V’s base configuration, but the Falcon Northwest option costs $2,442. Other competitors are also several hundred dollars more. An entry-level version of the Ra would be worth considering, even if it doesn’t stand out from the crowd.